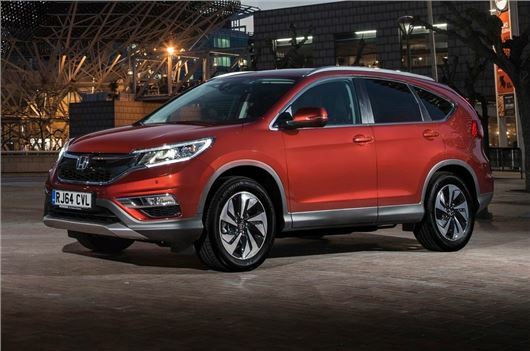 Prices for the revised Honda CR-V will start at £22,340 when it arrives in showrooms in March. That gets you the entry 2.0 i-VTEC petrol S model while the cheapest diesel will set you back £23,400. We've driven the facelifted model here and while it doesn't look very different, there are changes under the skin with a more powerful 1.6-litre i-DTEC diesel and a new nine speed automatic. As before both two-wheel and four-wheel driver versions are available. The new 1.6 i-DTEC replaces the 2.2-litre diesel. With 160PS it is exclusively mated to four-wheel drive. To achieve power that’s 10PS better than the larger outgoing engine it has added an additional turbo, boosting not just output, but improving responsiveness, all while reducing CO2 emissions. CO2 falls from 149g/km to 129g/km with economy improving markedly from 42.8mpg to 57.7mpg. The diesel is available with a new nine-speed automatic as well as the standard six-speed manual. Other new features include the i-ACC system, which comes as part of the optional Honda Sensing Pack, available on the EX trim. The system takes adaptive cruise control one step further, constantly scanning the road ahead to accurately predict the likelihood of drivers cutting in front when motorway driving, and will gently apply the brakes if necessary.